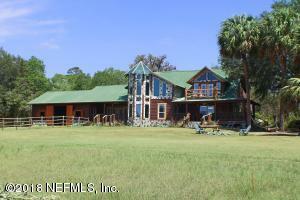 Custom-built log home on 373 acres of farmland. this 3,430 sq ft home is a piece of paradise. Take a tour and you will see the excellent craftsmanship in every sq ft. The open floor plan features antebellum southern pinewood floors and tile flooring, in the living room you will see one of the stone fireplaces with lighted glass block accents. Kitchen features lots of granite counter space with an extra prep sink, walk in pantry, stainless steel appliances, and large adjoining dining room. The master suite you can enjoy your own private stone fireplace and private porch. Master bath has a large walk-in shower, large jacuzzi tub, double sinks with a makeup vanity. Property features large 40x100 metal workshop, pole barn with horse stalls, and many water wells throughout the property.